Can you really sell your art? If you’ve ever tried to sell your artwork in person, you’ve probably read or been told that it’s beneficial to listen to your customers, and invite them to talk about themselves. That way, they will remember having a pleasant experience with you, and be more inclined to purchase something. It’s good advice in person, and for those of us blogging about our art, it’s good advice for us, too. But how (you might ask) can you invite readers to take part in the discussion, and have that “pleasant experience” when you’re the one doing all of the talking?? Although I post to my own blog regularly, I enjoy reading other artists’ blogs, too. I ALWAYS look for thought-provoking titles that immediately get my brain turning, or titles that make it clear that I’m going to get some information I can use by reading that blog post. The first title offers just a quick bite of information that seems totally based around you, whereas the second title draws your reader in with the promise of information that they could use, based directly on your firsthand experience. We artists walk a fine line in promoting ourselves and our work: many of us tend to be a bit humble, and almost experience physical pain when we have to put ourselves out there as salespeople (or maybe that’s just me!) Then there’s also the stereotypical artist, concerned only with herself and her latest masterpieces, expecting everyone to fawn over her genius. How do you avoid either extreme? Using your blog only to update work and tout your successes may sound like a good self-promotional tool, but if it’s not working (or enjoyable) for you, maybe there is another way. . . Try thinking of yourself as a contributor to an art “team.” When you’re reading blogs, you’re learning, and when you post, you’re in a position to coach and share with others. 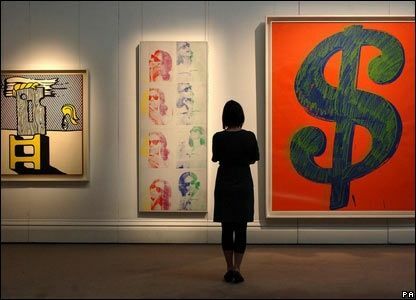 Even if your primary audience is made up of collectors, you can invite them into the world of creating by sharing more than just what your latest painting is and how much it would cost to buy. Remember, that old saying, “There’s no ‘I’ in team?” You can still promote your work for sale on your blog, just be mindful of your audience and draw the conversation away from yourself on occasion. Scroll through your last five blog posts and re-read them just for tone. Is it inspiring? Encouraging? Do you write to share a positive attitude with others? Do you write to encourage debate, or share your expertise? Of course you’ll be sharing your thoughts and opinions, since that’s part of the fun of blogging, but if you re-read your posts and realize that you sound like a bit of a sourpuss when you discuss your art, injecting a little lightheartedness into your writing on occasion may soften your image in the eyes of your readers, thus endearing them to you as a person. If your readers like you, they WILL want to know more about you and your art. If it gets your reader thinking about the topic and inspires him to continue the conversation in the comments or in his own posts or work, that’s even more exciting. Readers are likely to come back for more if they get something from your posts, so spend a little time creating posts that have something to offer. Collectors or local artists reading your blog might be inspired to go down and see your work in person, all because you took the time to add some inviting detail to your post. All of the work and hard-earned experiences you’ve been through in your artistic journey can only add to the interest level of your posts, so why not use them? Even if it’s been ages since the comment was made and you missed it, go back and thank the person or answer the comment (unless it’s someone with a bad attitude, just looking to start an argument—hopefully you use comment moderation and don’t allow those comments to be published). Your blog is like an open house for people to walk in and learn about your artwork. . . which means you get the chance to be a gracious host and make your guests comfortable. Enjoy the process! Get to know your readers and they’ll feel welcome to stop by again and again, enjoying your artwork and artistic journey every time they do.